The following VPC peering connection configurations are not supported. For more information about VPC peering limitations, see VPC Peering Limitations. You cannot create a VPC peering connection between VPCs with matching or overlapping IPv4 CIDR blocks. If the VPCs have multiple IPv4 CIDR blocks, you cannot create a VPC peering connection if any of the CIDR blocks overlap (regardless of whether you intend to use the VPC peering connection for communication between the non-overlapping CIDR blocks only). This limitation also applies to VPCs that have non-overlapping IPv6 CIDR blocks. Even if you intend to use the VPC peering connection for IPv6 communication only, you cannot create a VPC peering connection if the VPCs have matching or overlapping IPv4 CIDR blocks. Communication over IPv6 is not supported for an inter-region VPC peering connection. 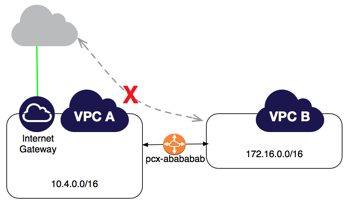 You have a VPC peering connection between VPC A and VPC B (pcx-aaaabbbb), and between VPC A and VPC C (pcx-aaaacccc). 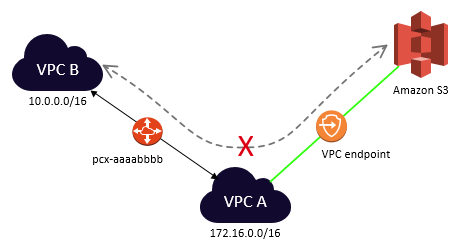 There is no VPC peering connection between VPC B and VPC C. You cannot route packets directly from VPC B to VPC C through VPC A. To route packets directly between VPC B and VPC C, you can create a separate VPC peering connection between them (provided they do not have overlapping CIDR blocks). For more information, see Three VPCs Peered Together. A VPC endpoint to an AWS service; for example, an endpoint to Amazon S3. (IPv6) A ClassicLink connection. You can enable IPv4 communication between a linked EC2-Classic instance and instances in a VPC on the other side of a VPC peering connection. However, IPv6 is not supported in EC2-Classic, so you cannot extend this connection for IPv6 communication. For example, if VPC A and VPC B are peered, and VPC A has any of these connections, then instances in VPC B cannot use the connection to access resources on the other side of the connection. Similarly, resources on the other side of a connection cannot use the connection to access VPC B. You have a VPC peering connection between VPC A and VPC B (pcx-aaaabbbb). 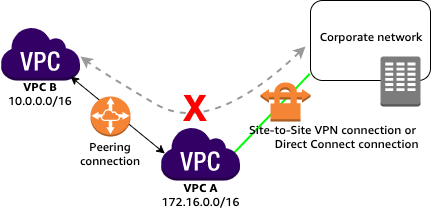 VPC A also has a VPN connection or an AWS Direct Connect connection to a corporate network. Edge to edge routing is not supported; you cannot use VPC A to extend the peering relationship to exist between VPC B and the corporate network. For example, traffic from the corporate network can’t directly access VPC B by using the VPN connection or the AWS Direct Connect connection to VPC A. You have a VPC peering connection between VPC A and VPC B (pcx-abababab). VPC A has an internet gateway; VPC B does not. Edge to edge routing is not supported; you cannot use VPC A to extend the peering relationship to exist between VPC B and the internet. For example, traffic from the internet can’t directly access VPC B by using the internet gateway connection to VPC A. Similarly, if VPC A has a NAT device that provides internet access to instances in private subnets in VPC A, instances in VPC B cannot use the NAT device to access the internet. You have a VPC peering connection between VPC A and VPC B (pcx-aaaabbbb). VPC A has a VPC endpoint that connects it to Amazon S3. Edge to edge routing is not supported; you cannot use VPC A to extend the peering relationship to exist between VPC B and Amazon S3. For example, VPC B can't directly access Amazon S3 using the VPC endpoint connection to VPC A.